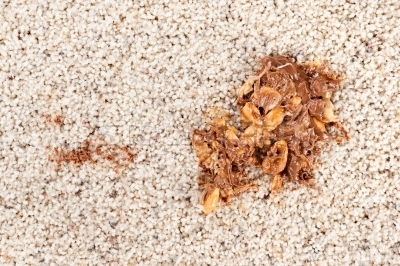 Kids love candy but carpets don’t. 1. Gently scrape or blot excess spill/dropped candy. 2. Apply club soda with a damp towel. let detergent sit for 3 to 5 minute. Make sure that you blot; don’t rub. 3. Apply water with a damp towel. 4. Blot dry. You want to make sure to use a weighted stack of towels to soak up the excess water. 5. As an added measure you may want to apply vinegar to the effected area once the stain is removed.